Successfully Added Grim Pilgrim Japanese Style LED Watch to your Shopping Cart. Introducing our most WTF watch to date: The Grim Pilgrim from star date 1620, the anniversary of the arrival of the USS Mayflower on the planet LV-426 (yes I said planet LV-426, google it if you're not familiar with this ahem benign planet) which gives its wearer terrifying psionic ability and the answer to the age old question "What's the sound of one hand clapping?" You mean this watch really tells the time? Yes, even though The Grim Pilgrim represents cutting edge emo design and globetrotting gothic style with its "she's got eyes of the bluest skies" LED numerals and hell bent for leather look wrist bands like a heavy metal hero bent on smashing The Seven Seals, this Japanese LED watch does in fact tell the time and does so really efficiently too! Tap the single button on the right hand side and watch the dot matrix screen come to life like zombies chowing down on a bunch of Spring Break party-ers. The Grim Pilgrim comes with time and date mode and a single action button for display (quick press) and setting adjustment (press and hold). Mr "I'm A Loser" Bek David Campbell and Uncle Rico are said to be Grim Pilgrim owners as are Cameron Frye and Michael Anthony Hall. In reality this watch is perfect for anyone who has ever DM'ed a Dungeons and Dragon campaign over IRC, people who love Doritos, fans of the Real Roxanne, or anybody who is a somebody. Extra power when backhanding someone in the Facebook! Watch Strap Material: Buckled leatherette originally used for flogging heretics with. If you're looking for the perfect birthday gift for your 40 year old son who still lives with you, whose room is plastered with Farrah Fawcett and Judas Priest posters, who drives a 83 Trans AM, and who sports a handybar stache....this. is. it. 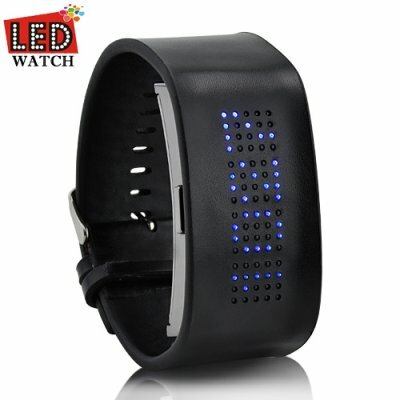 This LED watch uses two CR2016 watch batteries and comes pre-installed. Other names this type of battery goes by are button cell, silver button cell, or coin cell batteries. You mentioned that this watch is perfect for anyone who has ever DM'ed a Dungeons and Dragon campaign over IRC, people who love Doritos, fans of the Real Roxanne, or anybody who is a somebody. What if I don't belong to any of these groups? This watch is also perfect for fans of One Piece, Runecasters, people who believe Liam Neeson's Taken is a gajillion times better than Morgan Freeman's Shawshank Redemption, and anyone who knows all the lyrics to Evanescence's My Immortal (Mobb Deep Remix).